Explore the length of Vietnam, from Hanoi and Halong Bay, through to the UNESCO palace in Hue, streets and canals of Hoi An, down to Ho Chi Minh City. Vietnam is a warm and wonderful country, one where east meets west and one where it’s cheap to eat and stay. There’s more than 2,000 miles of it, mostly between Hanoi in the north and Ho Chi Minh City (still often known as Saigon) in the south. They don’t let foreigners drive here – a good thing as there are 45 million scooters in a population of 92 million and the people who aren’t steering seem to be on the back as they sweep down the pot-hole ridden streets. Not that locals worry, particularly the ones texting as they go. There’s only one single-track railway between the two main cities, a journey of 30-plus hours and even main road travel seems to be at scooter pace. 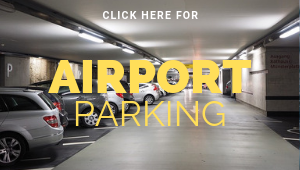 Tourist travel tends to involve plane hops and minibus jaunts accompanied by local guides. 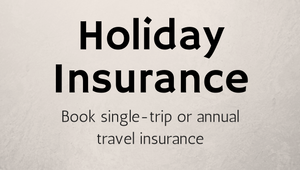 So, while it might not seem like a place for a touring holiday, there’s now a tourist trail from one end of the country to the other that can be accomplished with a bespoke travel company. It’s so relaxed that even the children will love it and with a family of four able to have a noodle dinner for well under £10, the value is remarkable. Only 125 miles from China, sitting on the mighty Red River although the waterside is mostly hidden behind ramshackle apartment blocks. We stay in the old town, a warren of narrow streets lined with little shops and littler restaurants. The cosy Hanoi La Siesta Central hotel, new yet colonial themed, has a top-floor breakfast room with panoramic views. A perfect introduction to the city is the Vespa Adventures, a nighttime buzz around the streets on the back of a scooter sampling food at every stop. The streets might be awash with two-wheeled traffic yet there’s a zen-like serenity to it, everyone going the same 20-25mph and everyone equal. We sample grilled pork nibbles and Vietnamese coffee (strong and black over ice with a glug of condensed milk) from the rooftop Eden café overlooking 19th-century St Joseph’s cathedral. We have beer and bun cha (grilled pork and rice noodles) in Bún Chả Huong Liên, opposite the table (now a shrine behind a plastic screen) at which Barack Obama ate with TV chef Anthony Bourdain in 2016, filming the latter’s Parts Unknown. We wash down smoked, dried water buffalo with rice wine at Ray Quan, wedged by the railway track and its rumbling trains and eat more noodles (and banana blossom salad) at Vin Phong in the French Quarter. 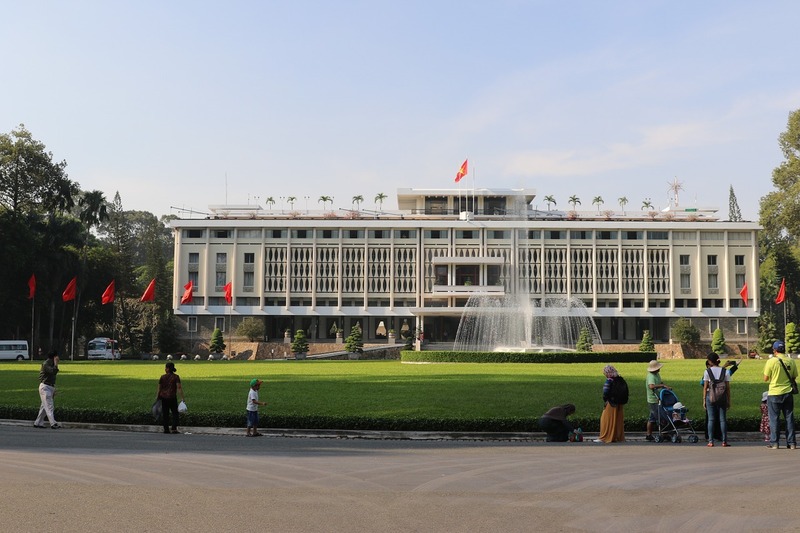 Next day we visit the grounds of the Presidential Palace, where Ho Chi Minh chose to live in a small house by a carp-filled lake. This was where, in 1969, he died and he lies in state in an imposing mausoleum. An unmissable experience is a walk across mile-long Long Biên Bridge (designed by Gustav Eiffel although much of his original was destroyed by US bombing) leapfrogging homes, banana plantations, island and river. Each side of the railway track is a footpath and a scooter road which in rush hour are filled by thousands of putt-putting machines. Stop for a banana at one of the many stalls. 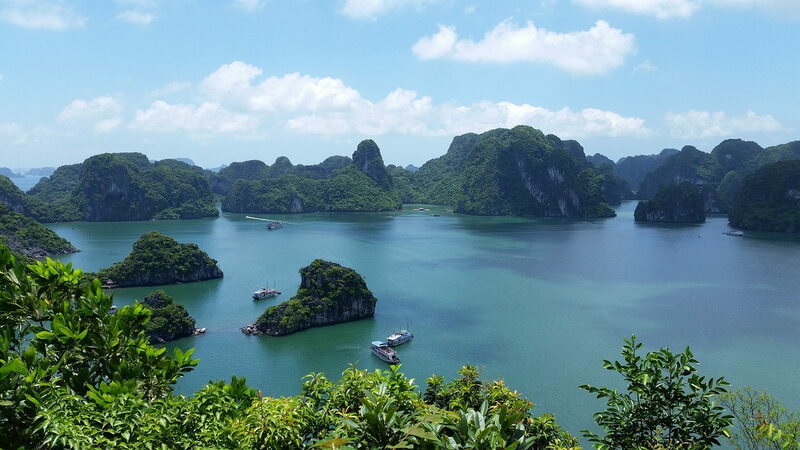 Two hours from Hanoi is this stunning bay that seems to go on forever, dotted with 3,000 jagged limestone islands. We take a two-day Bhaya Cruise, a boat for 30 passengers with wooden decks and rooms with colonial flair. We swim off the ship in the warm, placid waters, then call at Cua Van floating fishing village where the children explore in a kayak while we sit back in little boat rowed by a lady wearing one of the conical straw hats more normally seen keeping the sun off paddy field workers. Come sunset we’re enjoying grilled fish in the dining room that runs the boat’s length before trying our hand at squid fishing (to be honest it’s a stick, twine and hook under a bright light, which isn’t wildly successful). Next morning after choosing between pho (rice noodles in broth) and a fry-up for breakfast, we visit Hang Mê Cung cave on Lờm Bò island, a vast cavern where a prehistoric civilisation dined on sea snails – most of the shells are still here. 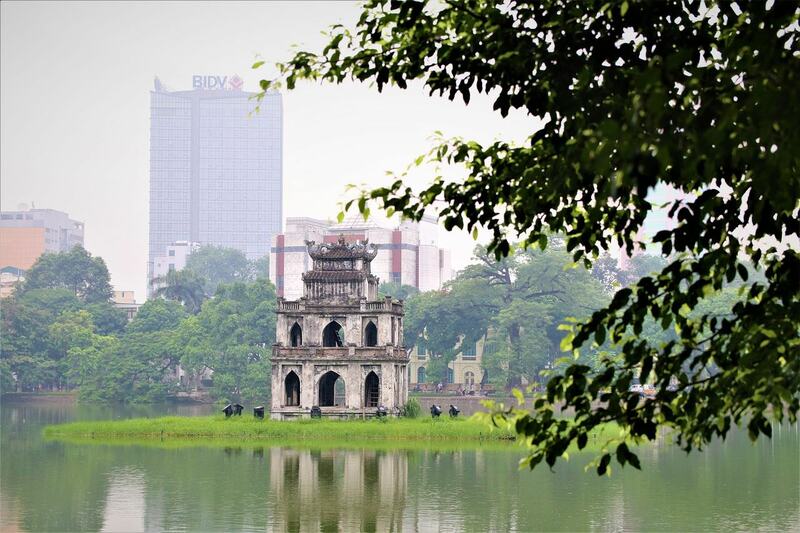 A short flight from Hanoi and we’re in Vietnam’s ancient capital (pronounced Hu-ay), home to the Imperial City. The UNESCO site, home to many an emperor, is modelled on Beijing’s Forbidden City, a vast complex of courtyards and pagodas surrounded by a lotus-filled moat. Much was destroyed by American bombs but restoration is underway. The peace here contrasts to the scooter-filled streets and our tour by cyclo (a chauffeur-pedalled tricycle). The site faces the Perfume River as does the vast Dong Ba market, selling just about anything you could ever eat. We find Co Chau, a stall of some notoriety , having been visited by Anthony Bourdain in another edition of his show, where he ate (as did we) bun bo Hue, a spicy variation on noodle and meat broth. A two-hour drive south passes vast lagoons, water buffalo squelching through fields and low peaks. This is the meeting of north and south; a road tunnel now carves through the mountains but we take the timeless, winding road over the top, giving panoramic views of Vietnam’s third city, Da Nang. This was where the Americans first came ashore, on China Beach, but it’s now a modern port (and cruise) city. 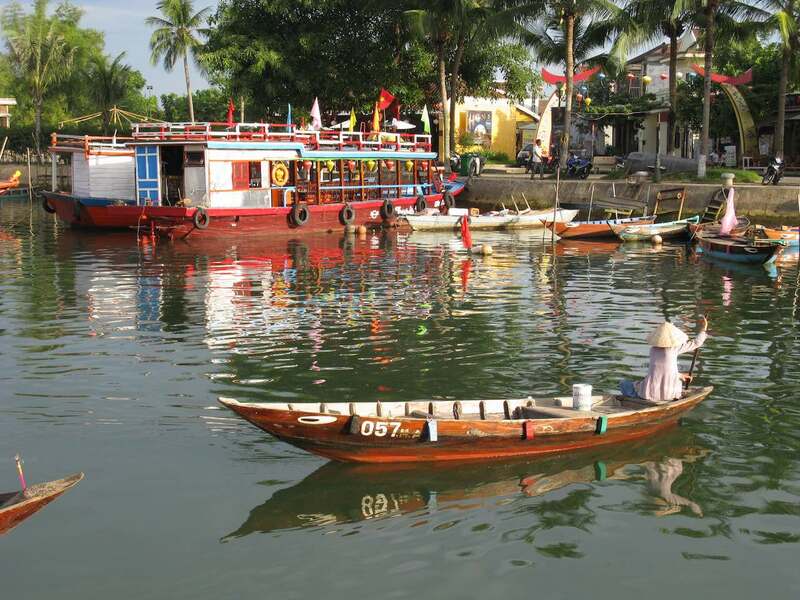 Hoi An is a little farther, an ancient fishing port on the Thu Bon river. The local, traditional buildings, a world of carved wood, line streets free of even scooters. By night the river is illuminated by lanterns of tiny boats carrying tourists, candles floating in cardboard saucers and the lights from riverbank food stalls. The big attraction is Red Bridge Cooking School. We start with a chef’s tour of Hoi An’s open-air fish market with crabs, shrimp, eels and plenty of less identifiable creatures then hop on a boat for a 20-minute journey upriver to the jungle-enveloped school. Here we learn to steam our own rice paper in which to wrap our neatly chopped vegetables and garden-grown herbs for spring rolls, then get to eat them and our other creations for lunch. 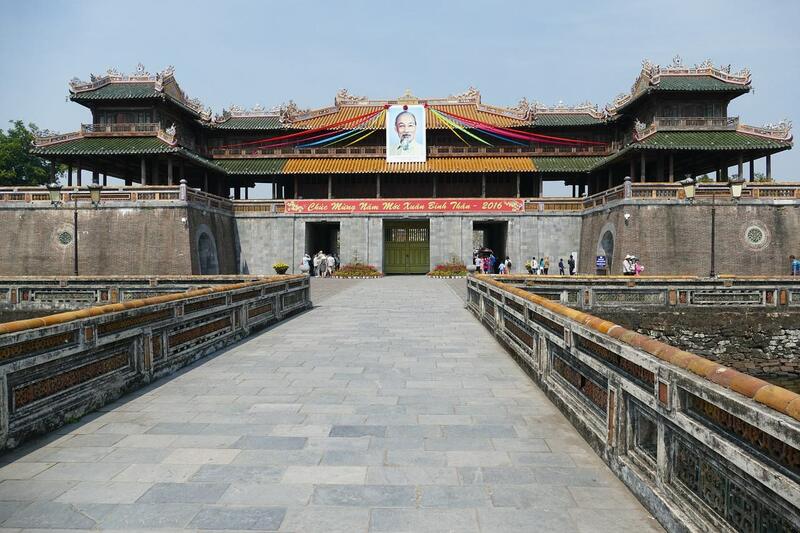 Hoi An place is a throbbing mix of local culture and international visitors. Our hotel, the La Siesta Resort & Spa, on the edge of town, is a place that combines Asian charm with American-style luxury – our room overlooks paddy fields as well as one of the open-air pools. It, like many other hotels, has a private stretch of beach on the coast, five minutes by free shuttle; we laze in the beautifully warm sea with views over modern Da Nang in one direction, the Unesco-protected Cham Islands in the other. 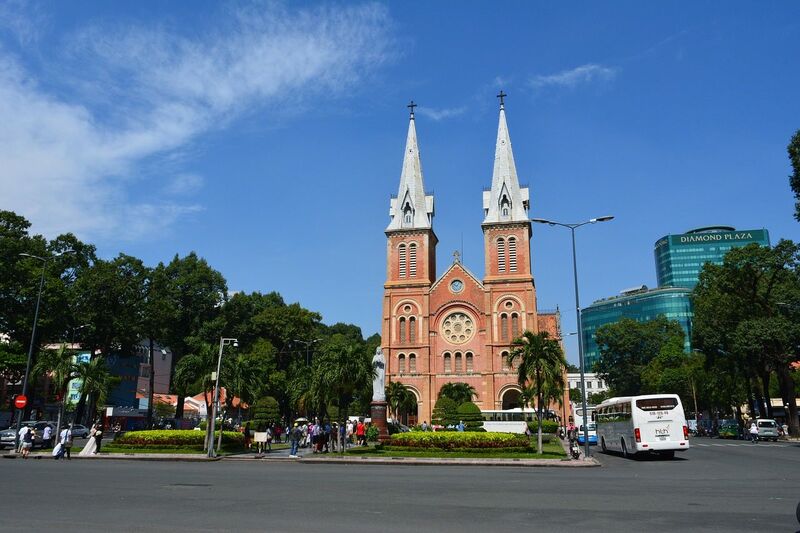 Barely an hour’s flight from Da Nang, this is an elegant place of tree-lined streets, part of its French heritage, but with increasing modern flourishes. Bitexco Financial Tower, looming over the Saigon river, has a 49th-floor 360-degree observation level (and 52nd-floor helipad) while Landmark 81, which has just pipped it as the city’s tallest skyscraper has a viewing deck on the 79th of its 81 floors, plus lofty restaurants. We’re staying at Central Saigon Citypoint hotel where the 19th-floor rooftop pool (and bar) is the place to cool down. We visit Reunification Palace, a 1960s architectural icon designed as the presidential palace for the south’s leader and where the two halves of the country were united in talks on April 30, 1975. Just in case things went belly-up, the subterranean war room has a tunnel to the waiting helicopter. The conflicts horrors fill the nearby War Remnants Museum, tanks and planes eclipsed by the hundreds of war photographers’ images. The scariest place of all is Cu Chi Tunnel, a couple of hours away, part of a 150-mile warren that served up to 2,000 people during the conflict. We squirm at the man traps fashioned from all manner of metal and bamboo spikes, marvel at a rusting bombed tank and then dip into a 50-yard stretch of tunnel that leaves us so disoriented that we don’t even feel like firing a machine gun at £2 a shot. Yet there’s far more to the city – the red brick Notre Dame cathedral, the grandiose Central Post Office, designed by Gustav Eiffel, who also designed the Opera House. And the 1908 City Hall, once the Hotel de Ville (based on one in Paris) is home to the council, or Ho Chi Minh City People’s Committee. 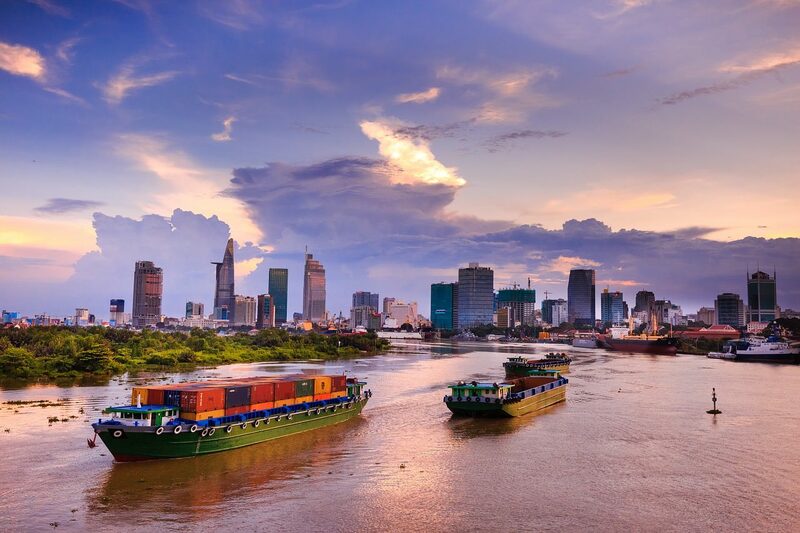 A modern treat is the Saigon Waterbus, a service that runs six miles, past glassy towers and colonial mansions, shack restaurants and fishermen. A return trip is only £1. 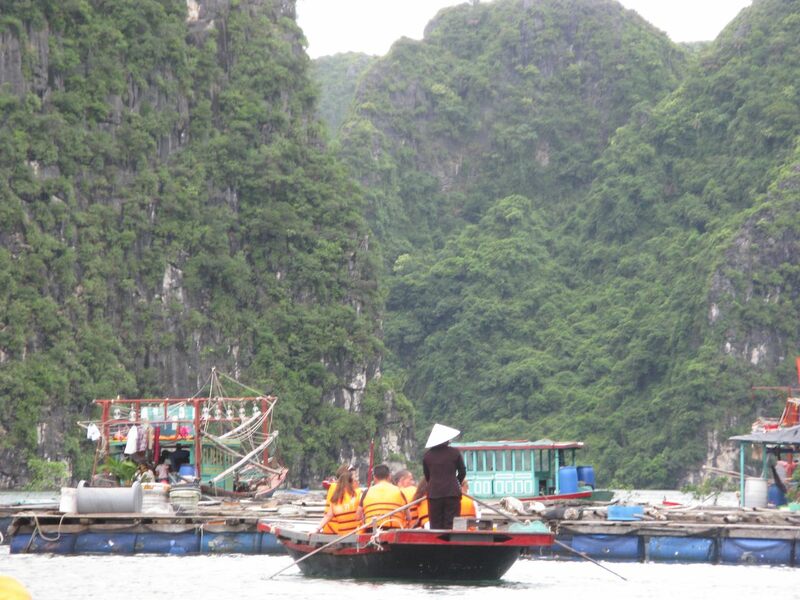 Just sit back and soak up the value of Vietnam. 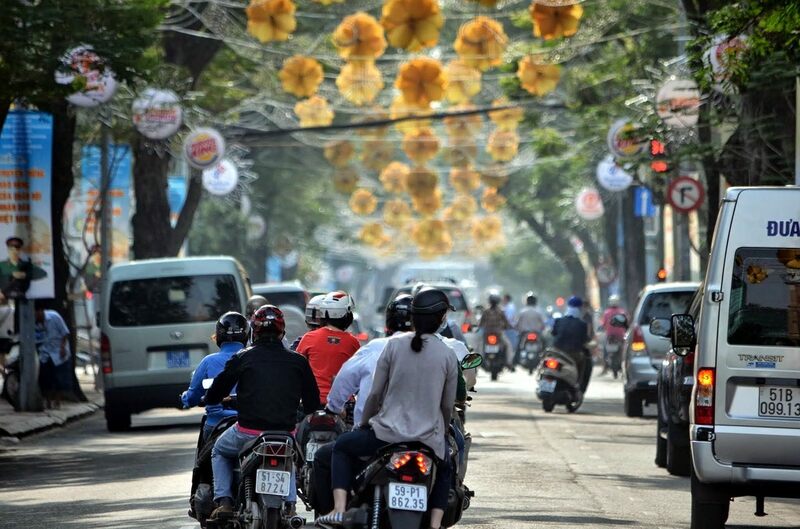 READ ALSO: Q&A: How do I apply for a Vietnamese visa? PACKAGE: Vivid Travel – 01483 355 345 – team of ‘travel designers’ can put together a similar 12-night taking in Vietnam from top to bottom.